Nxt assets are a convenient way to represent anything fungible and tradeable. An asset token could represent a bar of silver, a pizza redemption coupon, a share in a company, even a portion of a portfolio of other assets. By representing these things digitally on the blockchain, they can be publicly verified and easily traded. The NXT Asset Exchange (AE) is based on the concept of the ‘colored coin‘. 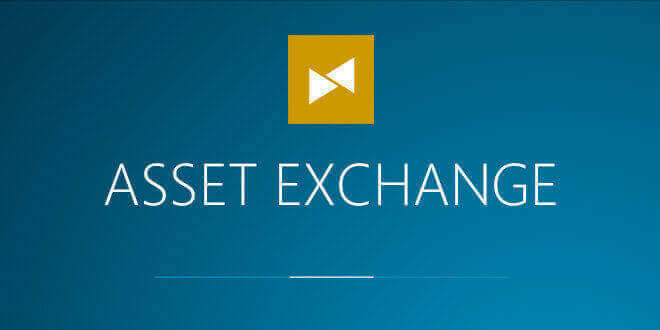 More specifically, the Nxt Asset Exchange is based on the ability of the blockchain to recognise and therefore trace the origin of transactions involving a coin or a set of coins which have been designated (or ‘colored’) to represent any type of asset you can imagine, whether digital (for example, stocks, bonds, smart property) or tangible (for example, cars, houses, precious metals etc). The Nxt Asset Exchange matches asset buyers and sellers, it works in a similar way to cryptocurrency exchanges. This tutorial will show you how to buy and sell asset tokens on the Asset Exchange. All asset exchange operations can be accessed from the sidebar in the official core Nxt Client. To view an asset, you’ll need to input the asset ID. You can search for an asset via the search box in the top left corner in the client. The search will open up a modal window, now click to view the asset in the Asset Exchange. You can bookmark an asset by clicking the button in the top right corner. Our ASSETHUB lists the most popular assets in a Top 50 with their unique ID. Sites like https://mynxt.info/assets and https://nxtportal.org/assets list all available assets. A Nxt asset is uniquely identified by its ID number. Asset names are not unique, this is to prevent names from being squatted on. So never rely on an asset’s name or description to identify it, always check that its ID number and the issuing Nxt account address match those announced by the asset’s issuer on e.g. their website/forum thread. There are scammers who issue assets with the same name as popular assets in order to try to trick people into paying for them. We’ll use the Jinn asset, which represents profit shares from the Jinn project, as an example. The Jinn asset’s ID can be found on Jinn Lab’s home page and on its announcement thread in the Nxtforum. Research any asset before buying into it, always. Check that the ID number is the correct one. To buy an asset on the Nxt Asset Exchange, place a buy order indicating how many tokens you wish to buy, and how much Nxt you’re willing to pay for each token. Selling assets is similar, but this is done on the right-hand side. Check that you’re performing the correct action by reading the description on the button (Buying is converting NXT -> assets, selling is converting assets -> Nxt). Before you confirm your order, also check that you have the correct number of digits before and after the decimal point. You can not bid for more than you can afford with the available NXT in your account. When you place a buy order, the total price of the order is automatically reserved from your account and cannot be moved or spent, unless you cancel the order. It will be deducted when the order is fulfilled. You also can not sell more tokens than you have in your account, nor, of course, can you transfer tokens from your account whilst they are still up for sale. You can see all your unfulfilled orders under ‘Asset Exchange -> Open Orders’. Unfulfilled orders can be cancelled at any time subject to payment of a transaction fee; once the cancellation of an order has been confirmed, the reserved NXT and the tokens that were for sale are released back to the account holder’s control. followed by the transaction ID (bids with lower transaction IDs have greater priority). Sell orders are prioritized similarly, but lower offers have greater priority. Higher priority orders are fulfilled first. All assets in your account are listed under ‘Asset Exchange -> My Assets’. Click on ‘Transfer’ at the right-hand side to send asset tokens to another account. Currently you can only send tokens of the same asset in a single transaction; you’ll need to make a separate transaction for each asset you want to send. You can also “burn” (effectively destroy) assets by using the “Delete Shares” button. Like most other transactions that add to the blockchain, it costs 1 NXT to place or cancel an order, or transfer an asset. The transaction fee is deducted from your account when the block containing the transaction has been confirmed. If your bid price for an asset is low, nobody may be interested in selling at that price, or it may be a long time before any higher priced buy orders are filled or cancelled and someone accepts your price. The order books and recent trades (below the buy and sell windows) can help you find a good price. Such recent price information can help you execute a trade quickly, but the price you have paid may not reflect an asset’s true value longer term. Beware of placing too much reliance on short term price movements, otherwise you might end up panic buying or panic selling which is a sure way to lose money. You need to take into account all available information regarding an asset and its issuer in order to reach a properly considered decision about the asset’s worth. Before buying an asset, you should at least understand what an asset represents and clarify any doubts with the issuer. On NXTER.ORG’s ASSETHUB you can read in depth asset research and find a Top 50 list over the most popular assets on the AE. Many assets are discussed on the nxtform.org assets sub-board https://nxtforum.org/assets-board/ and the Nxt Projects sub-board https://nxtforum.org/nxt-projects/. Here you can talk to asset issuers and other investors. You should check that the asset issuers are who they claim to be. So, for example, if someone advertises shares for profits from running a restaurant, you’d want at least to check that the restaurant exists, that they own the restaurant, and they know how to run it. And for profit shares, you’d also want to check that your expected dividends justify the cost of the shares. A good question to ask yourself is: “How likely is it that the asset issuer might disappear with any Nxt gained from asset sales, rather than follow through with their promises?” For example, if the issuer is anonymous, stands to raise a lot of Nxt from initial asset sales, and/or their stated plan for the asset seems very unlikely to be favorable for them, then they have incentives to just run away with your Nxt. But if, on the other hand, the issuer has a reputation that they want to protect and build on, and they have a sound business plan that stands to make them a lot more Nxt than the initial asset sales, then they have good reasons to honor their promises. Weigh the risks against potential returns before deciding if, and how much, you want to spend on an asset. Usually it’s more accurate to describe asset tokens as a promise to the asset holder by the issuer to, for example, exchange the token for a bar of silver, or pay dividends from company profits. The Nxt network cannot enforce these promises, it’s your responsibility to check that the issuers can make good on their promises, and it’s for you to decide whether or not to accept the risk that they may not do so. Regardless of how much due diligence, or even active involvement with the asset, you undertake, things beyond your control can still happen. Even the most trustworthy and capable people can be hit by the proverbial bus. Remember the standard advice regarding any type of financial investment: never invest more than you can afford to lose. Disclaimer: The information contained in this article does not constitute (and is not intended to constitute) any form of advice, recommendation, representation, or endorsement by the author or the web site owner and should not be relied upon when making (or refraining from making) any investment decision.